Careers in the restaurant industry require a passion for the cooking, commitment to customer service and a creative spirit. Expect a fast pace, requiring high energy and sometimes long hours. For those with the calling, the opportunities are many. Restaurants are the largest employer of graduates, with employment also found in grocery stores, corporate dining, mobile food services, hospitals, bakeries, assisted living communities, schools and universities, prisons, private households, amusement parks, cruise ships, national parks, and more! Student participation in CCI service-learning initiatives like Taste of the Town, Meal of the Year and Empty Bowls. 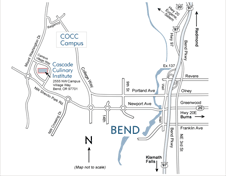 The Cascade Culinary Institute Culinary Arts Program is accredited by the American Culinary Federation Education Foundation Accrediting Commission (ACFEFAC), which is recognized by the Council for Higher Education Accreditation. This accreditation assures our curriculum is industry-relevant, current, and delivering the appropriate skills required for successful careers in the field of culinary arts. As an added value as a CCI graduate, students in either AAS degree program are eligible to qualify for the prestigious American Culinary Federation Certified Culinarian or Certified Pastry Culinarian certification. Graduates with this certificate have distinguished themselves by meeting high benchmarks in culinary techniques, nutrition, food safety, sanitation and supervisory management. Students must apply for this certification, and hold membership with the American Culinary Federation. Food service includes grocery stores, general medical and surgical hospitals, community care facilities for the elderly, nursing care facilities, elementary and secondary schools, private households, amusement and recreations industries in addition to full and limited service restaurants. Northeast and Western geographic regions are paid slightly more than in the Midwest and South. And corporate organizations typically pay higher salaries than other places of employment. Some employers provide employees with uniforms and free meals, but Federal law permits employers to deduct from their employees’ wages the cost or fair value of any meals or lodging provided, and some employers do so. Chefs, cooks, and food preparation workers who work full time often receive typical benefits, but part-time and hourly workers usually do not. In some large hotels and restaurants, kitchen workers belong to unions. The principal unions are the Hotel Employees and Restaurant Employees International Union and the Service Employees International Union. The National Restaurant Association Trends and Forecasting report provide additional insight as to career path opportunities for CCI graduates.